Blue water stretches to the horizon. Rolling dunes tower behind you, and a quaint harbor town sits along the shore. A gentle lakeside breeze sighs in from the water, and you sit down on white sands and watch the setting sun dye the clouds with vibrant pinks, oranges and reds. You could experience a stunning sunset like this from any of the Great Lakes. The size of inland seas, the five Great Lakes hold 21 percent of the world’s fresh surface water, and they have shaped the culture and commerce of North America for hundreds of years. The Great Lakes are majestic and breathtaking, the perfect destination for a relaxing vacation. Of all the states in the Great Lakes Basin, Michigan borders the most water — the state has the longest freshwater coastline in the world with around 3,288 miles of lakeshore. On a trip to Michigan, you can visit four of the Great Lakes — Lake Michigan, Lake Superior, Lake Huron and Lake Erie. That’s a lot of lakeshore to cover in one trip — with so much to see and do, planning a visit to Michigan’s lakes can feel overwhelming. To help you make the most out of your trip, we’ve created this visitor’s guide to Michigan’s Great Lakes to give you a starting point. Whether you want sun-filled days at the beach or hikes through sandy dunes, the Great Lakes have something to offer everyone. When you decide to visit Michigan, your destination could be a single town or lake. If you are visiting for a day or weekend trip, this is a great strategy — even one beach in Michigan has enough to keep you entertained for the duration of your stay. However, if you have a little more time in your schedule, consider taking a road trip along Michigan’s scenic coastline. If you plan your trip strategically, it’s possible to visit each of Michigan’s Great Lakes in one vacation. You can find detailed itineraries online that give you day-by-day examples of a trip along Michigan’s shoreline, and routes like the Great Lakes Circle Tour allow you to easily see the coasts of all four of Michigan’s Great Lakes. Below, we’ve sketched out an outline to give you an idea of the scope of a Great Lakes road trip. You can begin your route at Lake Superior in the north or Lake Erie in the south — both are excellent places to start a road trip through Michigan, and one point might make more sense than another based on your current location. In this sample route, we’re beginning at majestic Lake Superior and making our way south to the more urban Lake Erie. Lake Superior: Begin your trip in Michigan’s upper peninsula, either by car or flying into one of the regional airports. Make your way along the coast of Lake Superior and enjoy the spectacular scenery, including bright lighthouses, rugged wilderness, long beaches and towering cliffs. The area around Lake Superior is especially suited for those who love a little adventure in their vacation — make stops along the way to enjoy the many hikes and walks through the area. Lake Michigan: Once you have experienced the majesty of Lake Superior, cross the Mackinac Bridge and enter Michigan’s lower peninsula. Enjoy the picturesque beauty of Lake Michigan through a day at the beach or a trip onto the water — Lake Michigan is famous for its relaxing coastline, so if you are hoping for a day spent fishing, swimming or sunbathing, western Michigan is the place to be. This area is also dotted with many large cities, so if you are longing for an urban break from the natural scenery, make a few day trips to see what the cities have to offer. Lake Huron: Drive across the state to experience the harbor-filled beaches of Lake Huron. Along the way, enjoy the beauty of inland Michigan — make stops for wineries, hike through a state forest or spend an afternoon at a waterpark. Once you reach the shore of Lake Huron, make your way along the coast and experience the rich history and culture of the area through its museums, monuments and natural areas. Lake Huron is known for its shipwrecks, which make it a perfect destination for diving and snorkeling enthusiasts. Many areas of the lake are also ideal for boating and kayaking. Lake Erie: Finish your trip on the short coastline of Lake Erie. Take day trips to Detroit or Ann Arbor and enjoy the urban landscape surrounding the beautiful lakeside views. Lake Erie has played a vital role in the development of the Great Lakes region, and its coast has many parks, museums and activities to fill the rest of your itinerary. The area around Lake Erie is especially known for its bird life, making it a perfect destination for wildlife enthusiasts. Most of Michigan’s borders are coastline. This means that there’s a lot to see — you could spend a lifetime exploring the various towns and attractions filling the Great Lakes region. We’ve gathered just a handful of the beautiful sights to experience around Michigan’s lakes — whether you are looking for quiet lakeside towns, historical monuments, sprawling beaches or untamed wilderness, the Great Lakes offer something for every traveler. The shore of Lake Michigan is home to some of the country’s most beautiful natural attractions. Known as Michigan’s Gold Coast, the area is famous for its rustic orchards, world-class wineries, historic B&Bs and sprawling dunes. Sleeping Bear Dunes National Lakeshore:Sleeping Bear has everything you want from a beach. With abundant sunshine, clear blue water and plenty of lakeside activities like swimming and camping, it is the perfect way to enjoy the splendor of Lake Michigan. Make sure to explore the towering dunes behind the beach — some rise over 450 feet above the lake. US-2 Road Trip: One of the world’s most beautiful roadways, US-2 stretches across the northern edge of the United States. The Michigan leg of the road connects Manistique and St. Ignace in the upper peninsula, and it skims the northern coast of Lake Michigan. Take a road trip between the cities and enjoy stunning views of the shore, untamed woodland and rolling dunes, with plenty of smaller attractions to explore along the way. For the best scenery, make the drive in autumn when the trees are in peak color. Silver Lake Sand Dunes: Jump in a dune buggy and race through the dunes at Silver Lake State Park. This famous Lake Michigan destination allows you to enjoy the dunes up close and personal. Rent a buggy or try sandboarding down the golden slopes for a once-in-a-lifetime experience. The largest and northernmost Great Lake, Lake Superior offers stunning coastal views, rugged wilderness and pristine beaches. Twelvemile Beach: This twelve-mile stretch of white sand is one of the Great Lakes’ most picturesque beaches. Because it is on the northern rim of Lake Superior, the weather at Twelvemile Beach can get chilly, but the views and surrounding environments are so magnificent, you will hardly notice the colder weather. Pictured Rocks National Lakeshore:Pictured Rocks provides the perfect example of an untamed Michigan landscape. Filled with pristine beaches, rushing waterfalls, rugged sandstone cliffs and miles of quiet forests, Pictured Rocks is the perfect destination for adventure lovers and outdoor enthusiasts. To see the rivers and waterfalls at their fullest and most dramatic, visit during spring as the snow melts. Crisp Point Lighthouse: Lake Superior tends towards rough weather — to keep boats as safe as possible, the coast is dotted by over 30 lighthouses. If you have to choose one lighthouse to visit, Crisp Point is a must-see destination. This picturesque lighthouse has remained active for nearly a century, and the state has restored its iconic tower to provide visitors with an authentic look into what life was like for lighthouse keepers over the decades. The Great Lakes Shipwreck Museum: The Great Lakes Shipwreck Museum at Whitefish Point traces the wrecks that scatter across the floor of Lake Superior. With over 200 shipwrecks in the area surrounding the museum, the region is known as Lake Superior’s Shipwreck Coast. The museum includes top-quality exhibits featuring artifacts from the wrecks, along with artwork, models and maritime history programs. The second-largest Great Lake, Lake Huron lines Michigan’s east coast. The area is known for both its stunning scenery and extreme weather — while over 30,000 lovely islands dot the surface of the lake, more than 1,000 ships lie at the bottom of its gray-blue water. 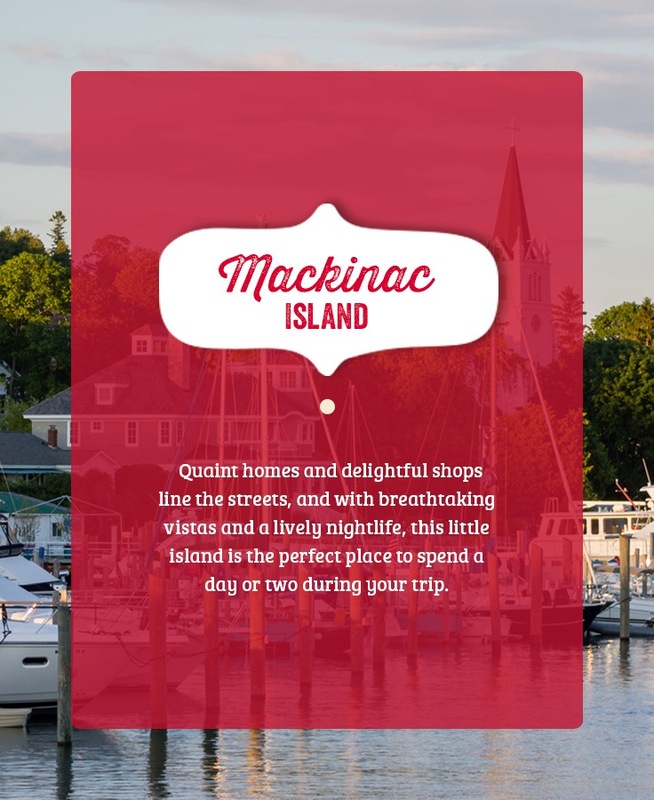 Mackinac Island:Mackinac Island is located in the northern waters of Lake Huron, and stepping onto the island is like stepping back to another time. Cars are prohibited on the island, so the only available transportation is through bikes or horse-drawn carriages. Quaint homes and delightful shops line the streets, and with breathtaking vistas and a lively nightlife, this little island is the perfect place to spend a day or two during your trip. Make sure to try some of the world-famous fudge while you’re there! P.H. Hoeft State Park: If you love the road less traveled, stop by P.H. Hoeft State Park. This lovely coastal park is relatively uncrowded no matter what time of year you visit, which makes it a quiet and relaxing way to enjoy the cool water of Lake Huron. Thunder Bay National Marine Sanctuary: If you have ever wanted to see a shipwreck up close and personal, you can’t miss Thunder Bay National Marine Sanctuary. Thunder Bay protects 116 wrecks, some dating back to the 19th century. Join a scuba diving or snorkeling tour to explore the wrecks at the depths of Lake Huron. If you prefer to stay on the surface, the area is also known for its exciting kayaking adventures. Although Michigan doesn’t share much coastline with Lake Erie, much of its lakeshore is close to large urban areas like Detroit. This means that the lake is easy to access, especially if you’re looking for a quick day or weekend getaway. River Raisin National Battlefield Park: This park was recently created to preserve and commemorate a battle of the War of 1812 — the battle marked the United State’s most devastating defeat during the war. The visitor center is free and features compelling exhibits about the war and the battle, providing insight into how the conflict shaped both the state and the nation. Paired with beautiful grounds, the River Raisin National Battlefield Park is a must-see for history enthusiasts. Sterling State Park:Sterling State Park is the only Michigan state park along Lake Erie, and it is only a short drive from Detroit. This park is the ideal lake getaway — the lovely beachfront is perfect for swimming, sunbathing and boating, and the waters off the coast offer fantastic fishing opportunities. Lake Erie Metropark: The Metropark offers three miles of shoreline filled with wetlands, lagoons and coastal marshes. This makes it a perfect place to see native wildlife — keep an eye out for muskrats, turtles, waterfowl and birds of prey. If you arrive during September, make sure to visit Hawkfest, where you might catch a glimpse of the thousands of migrating hawks that pass through the area every day. Michigan is a place of dramatic seasons. From vibrant autumns and icy winters to bright, sun-filled summers, your Michigan experience is largely determined by the time of year you visit. Winter in Michigan is filled with drifting snow and clear, bright skies. Winter-weather activities such as ice skating, snowshoeing and cross-country skiing are popular during the cold months. Although much of Michigan is covered in deep snow in winter, you can still see some beautiful sights — if you venture into the upper peninsula, you might catch a glimpse of the stunning aurora borealis dancing over the shore of Lake Superior. As the winter snows begin to melt, Michigan erupts with life. Flowers begin to bloom along the road and trees send out new leaves to catch the gentle sunlight. While spring is often muddy and quite cool, it is also a beautiful time to visit the lakeshore. The conditions are perfect for fishing, and Holland’s annual Tulip Time Festival is one of the state’s most iconic celebrations. Summer is the season of warm, lazy days and relaxing nights. Summertime in Michigan is the best time to visit if you are looking to spend a day at and in the lake — the water and weather are both warm enough to make swimming fun and refreshing but watch out for mosquitos during June. Michigan summers are rarely sweltering, with temperatures hovering around 80 degrees Fahrenheit. Michigan autumns are some of the most beautiful in the world. The trees erupt in vibrant colors, making it the perfect time for a road trip. If you visit Michigan’s Great Lakes in autumn, you are sure to experience gorgeous scenery — take advantage of the season by taking a hike through breathtaking forests, picking apples in a local orchard or fishing for salmon in a secluded river. No vacation is complete without high-quality food — enjoy the world-famous taste of Giordano’s pizza along with the majesty of Michigan’s Great Lakes. With fresh ingredients, perfectly flaky crusts and a signature recipe, Giordano’s has provided authentic, Italian-style deep-dish for nearly 50 years. We have locations along both Lake Michigan and Lake Erie, so no matter what coast you’re visiting, you can experience the iconic taste of Giordano’s during your vacation. The Great Lakes have something for everyone, whether you are looking for a relaxing day at the beach or a trip to one of the nation’s most iconic lighthouses. Experience the beauty of the lakes for yourself — and don’t forget to stop by Giordano’s on your next visit!